Today’s high was only 5*C (41*F) – the day was cold, dreary and wet. I must not have moved far enough South for a sufficiently warm winter. At least we had warm clothes available. 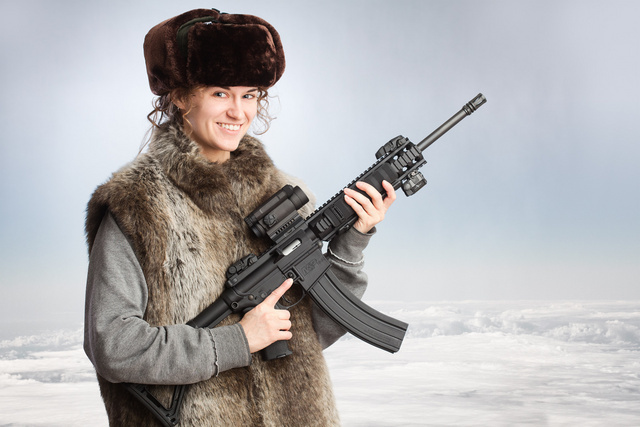 This entry was posted in interesting people, rifle, weapon and tagged 22LR, fur, smile, winter, woman. Bookmark the permalink. 45F? Hell, that’s t-shirt weather, Man. Sports Illustrated did a bikini shoot in Antarctica. It was “news” for days. Cold bothered me less when I was under 40. The low light IDPA match this evening ought to be quite chilly.